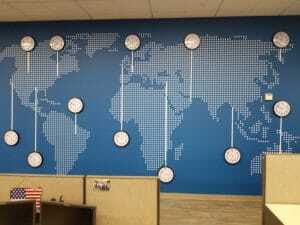 What are SEG fabric graphics? Silicone edge graphics is commonly known simply as SEG. First your image is printed on a stretchy fabric then a thin silicone bead is sewn around the edge of the graphic. The SEG is then flush-mounted into a channeled extrusion (frame). This creates a seamless, continuous image that conceals the extrusion and completely showcases your visual. SEG can be both non-illuminated and back-lite to create a dramatic effect. When all done, you are left with signage that pops with vibrant color and sophistication. What are the benefits of using fabric and SEG? Fabric is an outstanding material for printing for a number of reasons. First is quality. The color and image reproduction are almost photographic.Due to the dye-sublimation process used to print fabric transfers the ink directly into the material so colors are rich and true. 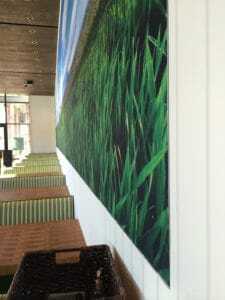 Fabric also absorbs light so it makes an excellent backdrop that is non-reflective compared to other media like vinyl. So feel free to create a selfie wall or use in a well lit space you won’t have to worry about light bursts on your image. Thanks to the dye-sublimation process, fabric holds it color and won’t fade providing a long life for your signage. If you want to store the graphic you can simply fold it and put it in a sealed plastic bag until you wish to display it again. Typically it stores crease-free and wrinkle-free, but if you detect some when you unfold it you can easily steam them away and your graphic will look brand new. If you get the graphic dirty, typically you can simply wash the graphic (check the care guide first). SEG is lightweight easily installed and usually can be installed by almost anyone. Simply by pressing the bead into the channel and working your way around the graphic. One of the big benefits of SEG fabric frames is how versatile they are. 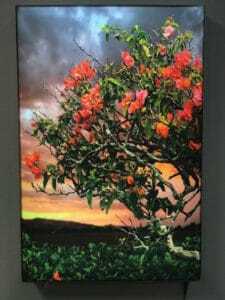 The same frame can be wall mounted, suspended from above, or used as a floor standing display by ordering the frame with a base. 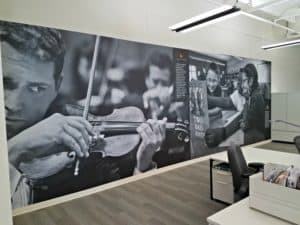 This makes them excellent as point-of-purchase, or POP displays, for use as wallscapes and graphics on perimeter walls, as part of window merchandising displays, and even integrated into other store displays and fixtures. Because they can be used at very large sizes, as well as for backlit applications, they are the perfect solution for high-impact displays that are sure to attract attention and engage customers. Another great use is to reduce echoes or noise by utilizing sound dampening technology with your graphics. We offer Quiet Art™ a revolutionary solution to acoustic management. Quiet Art™ conceals sound dampening panels behind your SEG image, providing the perfect blend of art and science. Of course the graphics look amazing, but one of the surprising benefits of SEG is its affordability. Because of it being light weight and foldable, shipping fabric is typically a fraction of the cost of shipping other signage media. The cost savings really add up when you need to ship to multiple locations such as for retail POP. The savings on shipping are often greater than the cost of production allowing you to update your graphics more frequently. SEG is also so easy to install that for most signage, you do not need to hire professional installers to get a perfect, clean look. Colors are more bolder and deeper colors than most other options. Cost-efficient with simple installation, lightweight, and more affordable to ship and store. Glare-free and more legible in bright lights and sunlight. Versatile framing options: Single-Sided, Double-Sided, Back-Lit, Thin or Wide Framing. Sophisticated extrusions conceal visible hardware to allow all the focus on the image. 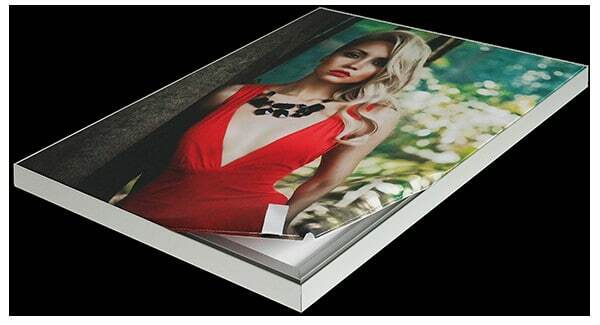 Seamlessly prints to the edges with no folds or creases. Durable and long lasting: can be steamed or machine washed.